For years librarians have sought out bilingual books–books that included both English and another language. We continue to do so and, in fact, several recent posts on listservs have asked for potential sources for these bilingual books. They are seen as important tools in the development of literacy and are aides in learning a second language. Reading skills transfer across languages and if you can read in one language you can read in another as you learn another language. What I’m finding interesting now is the increasing availability of polyglot, or trilingual, books. Yes, we’ve had a few books in the past that include rhymes, phrases, or son gs in multiple languages, but each entry has usually been in English and one other language. I’m curious whether the increase in polyglot books is a trend that will continue and I’m also interested in how the books are being used in storytimes and with young children. 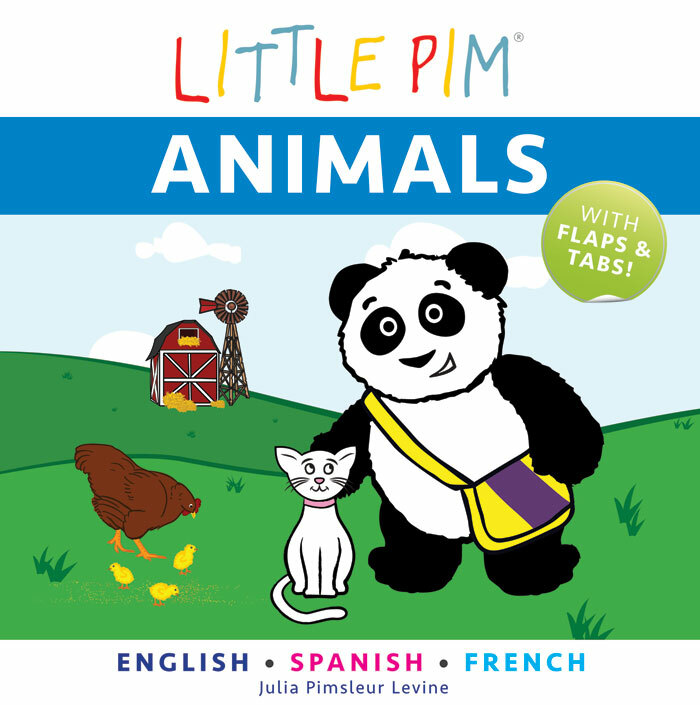 The Little Pim book series by Julia Pinsleur Levine recently released sever al board books with different sections of the text in English, Spanish, and French so that the child being read to can learn words in all three languages. 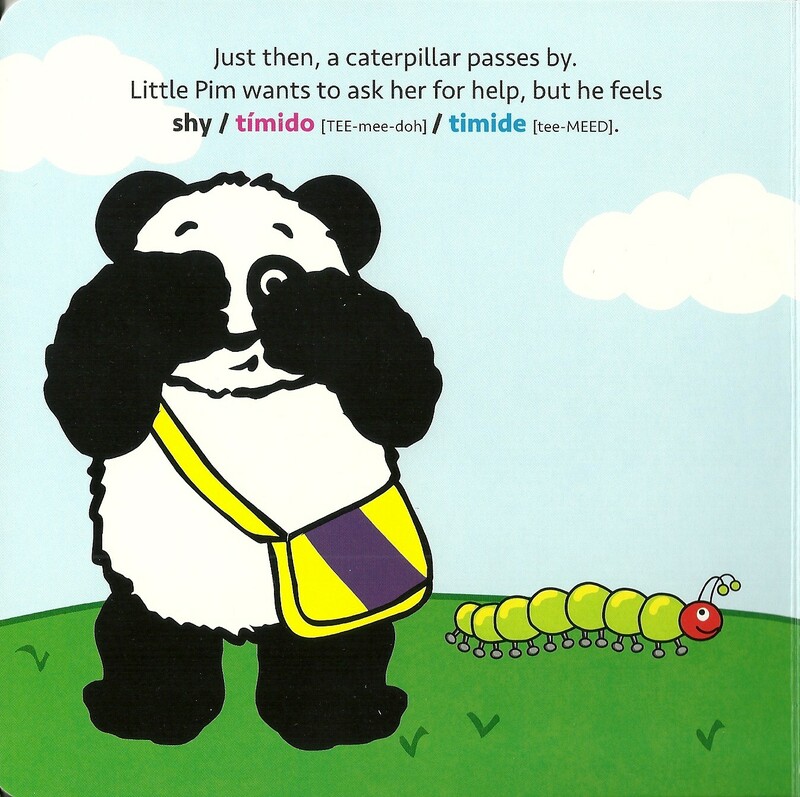 Little Pim, the trademark panda, is featured in stories that showcase colors, feelings, animals, and numbers. Each page has some task for him, such as finding the red item or identifying the happy face, and pull tabs or flaps that reveal the answer or the correct item. 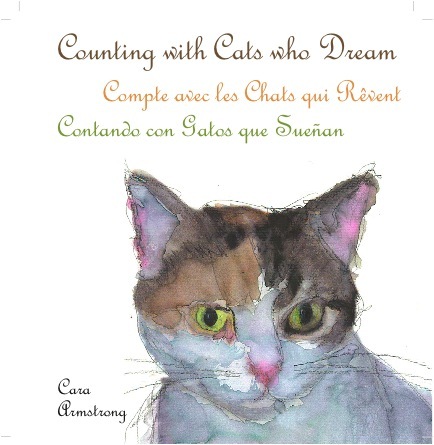 Another concept book, Counting With Cats Who Dream by C ara Armstrong was originally going to be published only in English and French. The story features short vignettes about different cats, where they live, and what they dream about as the reader counts cats from one to ten. I was asked to read an advance copy of the book and comment on it. Part of my feedback was that the book would be even more useful for a bilingual/multicultural storytime if it were also available in Spanish. Sometimes publishers do listen and the story is now to be released in the three languages. So how are librarians using books with multiple languages? Do they work for storytimes? Are parents who want their child to be able to speak more than one –or even two– languages finding them? What other languages will we start to see mixed in with English and Spanish? Are young children learning to count cats in multiple languages? What other titles are out there? Please share your experiences. Jeannette, I’m so glad you pointed out that reading in one language supports reading skills in new languages. I work at an elementary school outside of Washington, DC where 88% of our families speak a language other than English at home. We have a separate section of the library for books in foreign languages, and I wrote a grant a few years ago to purchase more titles. We have summer library hours once per week, and parents come to check out books with their children. I’ve got signs in several languages in this section with quotes about how reading skills in one language transfer to other languages. Many of our parents worry that their home languages will interfere with their children learning English, and I want them to know that this isn’t the case! We don’t read books aloud in two languages, because there are 39 languages spoken in our building. But if I share a story with children in English and we have copies of the same book in other languages, I point this out to kids, and the foreign languages editions are almost always checked out that day. Thanks for sharing your experience, Natalie. I hope these kids do hang on to their language skills. It’s so much easier to learn new languages when you speak several already.